After dinner you can comfortably spend the night in one of our rooms, surrounded by vineyards, both at the Hotel Classico and Nuova Ala near the outdoor pool. From the rooms, decorated in nineteenth century Piedmontese furniture, you can admire the Castle of Barolo, where Barolo wine first originated. Guests may check in from 15:00 to 20:00. In order for us to better welcome you, please send us an e-mail indicating your arrival time as well as if you need to check in at a time different from regular hours. 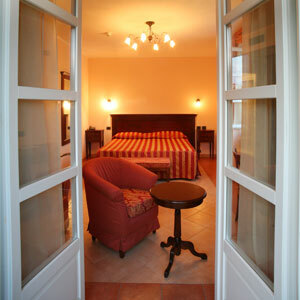 Should you be late, please call us immediately at +39 0173.56354  / +39 0173.560535. On your departure day, you must leave your room by 10:30. If you haven’t chosen the half board or restaurant service, please inform us upon arrival or during your stay if you wish to have lunch or dinner at our restaurant so that we may reserve a table for you (reservation is required on the weekends).